Modern fishing rods are made from Graphite Carbon or Fiberglass, or composition. Most of the credit for spectacularly growing popularity of fishing is given to manufacturers who produce cheaper, lighter, stronger rods each season. Best quality refers to Japanese materials and equipment. As far as design and engineering are concerned the Japanese technology is still the best in the world by far. Graphite Carbon Fiber is manufactured in Japan by Toray Industries, Inc, that is currently the world's largest producer of carbon fiber and Japan's largest producer of synthetic fiber. Bamboo rods are unique and excellent, they vary most in price, as they run from inexpensive to quite pricey. Benefits to bamboo fishing rods are plenty. They're lightweight, water resistant and durable. Tonkin Cane, recommended to be one of the strongest species of the bamboos due to its high density of fibres, is popular with bamboo rod makers because of its straightness, well spaced nodes, flexibility and strength. Calcutta bamboo is considered even better, but it's much harder to find. Tonkin bamboo comes from the the banks of the Sui River in China. The bamboo cane is cut into strips and heated. The heated, dried strips of bamboo are then shaved down to form angles that, when matched, form a hexagon. Clamps hold the fishing pole together and it is again dried with a heater. After drying, the new fishing rod is glued together and held with clamps until the glue dries. The final step involves sanding the surface and placing the eyelets that hold the fishing line and then the fishing reel. Regardless of the bamboo used, it takes approximately 80 to 100 hours to build one bamboo very expensive (the craftsmanship involved) fishing pole. Madake - is one of the most common bamboos in Japan. It is grown in the south of the Tohoku region (Northern Japan). It is 10-20 meters tall, 5-15 centimeters in diameter. The bamboo shoot is edible and more bitter than other species. It is used in the tip section of Hera rods. Two-four pieces are split from the bottom section of the bamboo and are bound and glued and then shaved in a circle. The highest grade is not bound; it is made from 1 piece, thus, this bamboo is the strongest. Most of the materials used for fishing rods are of the highest grade bamboo. One bamboo can be shared with other rod builders because Hera rod builders use the part of the bamboo 6 feet from the ground and other use the section just above that part. The 3 month varnish process or (Urushi lacquer finish) comes from the ancient (dates back to 7000 B.C.) Natural Varnish Tree "Rhus verniciflua". Concerning the lacquer, when fully cured it's stronger than urethane. It creates a very tough membrane on the surface of the bamboo. Because it is very thin, no cracking occurs when the bamboo bends. Also, the lacquer forms a better molecular bond with the bamboo, better than you think is possible. The traditional wiping technique used in Japan brings out the beauty of the natural material. Unlike the lacquer ware (bowls and dishes) that uses many thick coats of lacquer and iron hydroxide to make it black, for bamboo rods a very thin coat is used and then wiped to remove excess. These very thin coats are repeated many times over 3 months and the result is a thin coat that is flexible and waterproof, but heat resistant and very durable. Because urushi lacquer does not use organic solvents, it will not melt down like urethane when exposed to high temperatures. When this process is completed it produces a finish like glass. Bamboo is definitely not as strong as graphite when made into a fishing rod, but is much lighter and more flexible. Japanese bamboo rods need a lot more care and attention than graphite; at the least, a trip back to its maker at least once a year to be waxed and re-straightened. Fiberglass rods are usually inexpensive and typically geared towards beginners. These rods need little maintenance, have an average weight and a good all-around rod strength and are not easy to break. Carbon fiber (alternatively called graphite fibre or carbon graphite) is a material consisting of extremely thin fibers about 0.005�0.010 mm in diameter and composed mostly of carbon atoms. The carbon atoms are bonded together in microscopic crystals that are more or less aligned parallel to the long axis of the fiber. The crystal alignment makes the fiber very strong for its size. Several thousand carbon fibers are twisted together to form a yarn, which may be used by itself or woven into a fabric. Carbon fiber has many different weave patterns and can be combined with a plastic resin and wound or molded to form composite materials such as carbon fiber reinforced plastic (also referenced as carbon fiber) to provide a high strength-to-weight ratio material. The density of carbon fiber is also considerably lower than the density of steel, making it ideal for applications requiring low weight. The properties of carbon fiber such as high tensile strength, low weight, and low thermal expansion make it very popular in aerospace, civil engineering, military, and motorsports, along with other competition sports. The company continued making carbon fibre, developing two main markets: aerospace and sports equipment. The speed of production and the quality of the product were improved. Carbon fibers are classified by the tensile modulus of the fiber. Tensile modulus is a measure of how much pulling force a certain diameter, in other words how much load per square inch of cross section ("stress") the material can tolerate before breaking. The English unit of measurement is pounds of force per square inch of cross-sectional area, or psi. Carbon fibers classified as "low modulus" have a tensile modulus below 34.8 million psi (240 million kPa). Other classifications, in ascending order of tensile modulus, include "standard modulus," "intermediate modulus," "high modulus," and "ultrahigh modulus." Ultrahigh modulus carbon fibers have a tensile modulus of 72.5-145.0 million psi (500 million-1.0 billion kPa). As a comparison, steel has a tensile modulus of about 29 million psi (200 million kPa). Thus, the strongest carbon fiber is about five times stronger than steel. The term graphite fiber refers to certain ultrahigh modulus fibers made from petroleum pitch. These fibers have an internal structure that closely approximates the three-dimensional crystal alignment that is characteristic of a pure form of carbon known as graphite. Modulus is a measure of stiffness, how far the material stretches for a given stress. Modulus is the ratio (espressed in millions of psi, "pounds per square inch", a measure of a force on an area) between stiffness and weight of the graphite blank. The higher the modulus, the more energy the rod can store and release. The energy is a way of saying the speed and the power of the rod. Think of a swimmer on a diving board and try to imagine to variate the properties of the jumping board and you will see what it is. Some also simply by saying that modulus is resistance to flex and the higher the modulus the stiffer the rod. Beware, though, the higher the modulus, the more expensive is the blank and also more brittle the rod after an impact. There are many types of carbon fibers: IM6, M8, M55, M40, M40J, M46J, T300, HR40, and more. Each have their own properties: which are the modulus and the strength. Good fishing rods have generally speaking a high modulus, a high strength, and intermediate percentage of fibres. The modulus is given as force per unit area, for a material, so saying 33 million modulus or 33 Msi means 33 million pounds per square inch of material. High-modulus, type HM (modulus between 350-450Gpa). Intermediate-modulus, type IM (modulus between 200-350Gpa). Superhigh-tensile, type SHT (tensile strength > 4.5Gpa). The less a material will bend before it begins to fail the higher the modulus. High modulus materials can be used to make soft rods, and conversely, low modulus material can be designed into making stiff rods. The higher the modulus of graphite, the higher the stiffness, the lower the strength. A 57 million modulus graphite rod will be lighter and stiffer (therefore more brittle) than a rod rated at 44 million modulus. The higher the modulus, the more expensive the rod will be. IM 7 graphite offers a nice compromise being light, sensitive and not overly expensive. Don't get too caught up with the modulus rating. Rod mfrs started pumping those figures out to the public years ago in an initially successful effort to con us into thinking that "higher modulus"="more sensitive"="better". Just because a higher modulus graphite fiber itself may be lighter does not mean that the finished rod (or blank) will be lighter or better. The graphite fiber must be bonded with a resin (weight) and is typically given a glossy finish (more weight). This doesn't even take into account a much more important factor: rod/blank design & taper. Just go put some rods in your hand. String them up, if possible, for a test drive. See what feels good to YOU, because you're the one that's got to fish it. Carbon fibers are filamentary forms of carbon, with a fiber diameter normally in the 6-10-micrometer range. 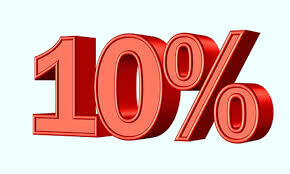 The product is offered in the form of yarns or tows containing from 1000 to 500,000 filaments per strand. The fibers offer a unique combination of properties. They are flexible, lightweight, thermally and to a large extent chemically inert, and are good thermal and electrical conductors. In their high-performance varieties, carbon fibers are very strong and can be extremely stiff. The principal use of high-performance carbon fibers is as the reinforcing component in structural epoxy matrix composites. Due to initially high cost, the original applications were almost exclusively for lightweight, high-stiffness, and high-strength composites for the aerospace industry. The second major usage of high-performance carbon fibers is in sporting goods, such as golf club shafts, tennis rackets, fishing rods, and sailboat structures. The major matrix material for both applications is epoxy. Technology is the real thing that can capture the needs of anglers to take advantage of the management and evolution. 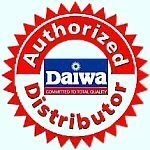 DAIWA use different "Carbon Technology" in the right place, has been the aim of realizing the highest level of performance for each type of fishing. 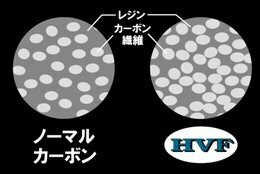 HVF Carbon fiber - In contrast to normal carbon fiber rods with high resin content in the space between the carbon fibers DAIWA HVF rods are made of a carbon fiber compound with reduced the amount of resin, put a tight carbon fiber that minute, achieve more muscular and powerful rod. Since resin has a high weight, rods made of HVF are more condensed, more light weight and feature a faster action. Widely used, such as rocky rod with an emphasis on strength and stickiness. SVF Carbon fiber - In contrast to HVF carbon fiber rods SVF carbon fiber rods are more sensitive and light weight, since they feature less resin content, increase the degree of adhesion of carbon fiber in the hot press process, achieved power slender lightness. The action is ultra fast and the notorious torque is reduced to a minimum. Being used to lure such as a pole or rod with an emphasis on streams without a sharp shake. Super SVF Carbon fiber - The resin content is reduced to a minimum, high modulus carbon fibers are used, combined with technologies such as air-gloss finish V joint structure and super-ring, lighter, high-sensitivity rod realized. A high-performance rod is used, such as ayu. Extreme lightweightness and an ultra fast action are the characteristics, which qualify rods made of SUPER SVF. Since this material is very expensive, it is only used for top quality rods. Z-SVF Carbon fiber - Z-SVF is the most lightweight carbon fiber material DAIWA has ever applied. This higher-density material can only be used for a few rods, since is it very expensive and very complicated in the blank manufacturing process with the molding condition setting for it. It was closer to the ideal array of carbon fiber "Z-SVF".